Back in 2005 when Illinois Governor Pat Quinn was second-in-command under Blago, he did cyclists a huge favor by bullying Metra into allowing bikes on board. This opened up a whole new world of options for affordable, car-free road trips–even after the commuter rail system hiked its fares last year, a weekend pass is a mere seven bucks. You can hop the Union Pacific North Line all the way up to Kenosha, Wisconsin, then pedal thirty-five miles to downtown Milwaukee–it’s a hell of a lot cheaper than Amtrak, whose Hiawatha service to Cream City costs $46 roundtrip and doesn’t allow unboxed bicycles. Or bike thirty miles south from the Loop via trails to Munster, Indiana, for gourmet burgers and craft beers at Three Floyds, a heavy metal-loving brewpub, then spin ten miles west to Flossmoor Station Brewery, where you can catch a lift home at the adjacent Metra stop. Architecture buffs can ride Metra’s BNSF Railway Line west to Aurora, then pedal eighteen miles along the Fox River to Plano, Illinois, and tour the Farnsworth House, the iconic steel-and-glass structure on stilts designed by Ludwig Mies van der Rohe. For an easy bike camping trip, ride the Milwaukee District North Line to the town of Fox Lake and cycle five miles to Fox Lake State Park, where you can rent a canoe and explore the Chain O’ Lakes region. For St. Patrick’s Day, I organized an excursion that harnessed the full range of the Metra-plus-bicycle combo. For most of the last decade I’ve led an annual hundred-mile winter bike ride to Milwaukee called the Frozen Snot Century. 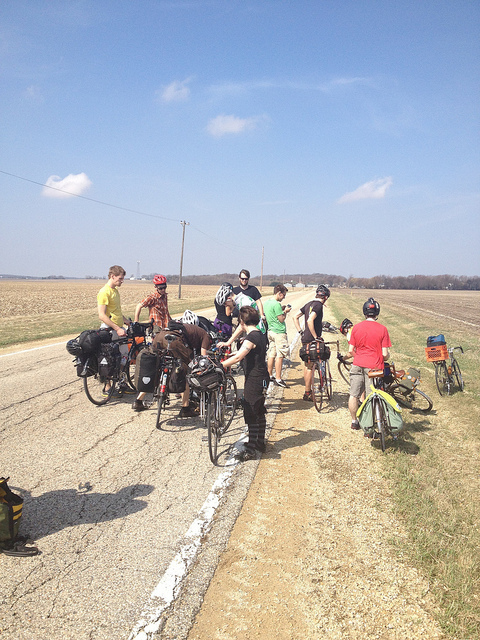 This year we decided to mix things up by instead catching the Union Pacific Northwest Line to Harvard, Illinois, then pedaling the remaining seventy-five miles to Madison, Wisconsin, where we’d stay overnight with locals and return the next day. Due to the freakishly warm weather this year, it would have been more accurate to call it the Molten Snot Century. The train passes through a short downpour that briefly turns to hail. At 10:30am, we arrive at Harvard, a farm town of 9,500 people that was once home to lawyer Clarence Darrow and President Gerald Ford’s mother Dorothy. The skies have cleared by now, so we hop on our bikes and pedal north under ideal conditions, seventy-five degrees with a helpful tailwind. As we cross the “Cheddar Curtain” into Wisconsin, I’m reminded how the sky always seems so much bluer up here, away from the Chicago smog. Navigating with a bike map published by the Bicycle Federation of Wisconsin, we stairstep northwest on county highways and quiet farm roads. The rolling hills we encounter are a refreshing change from our pancake-flat city. We stop at the quaint village of Milton for lunch at the Parkview Cafe, where locals are tucking into the St. Patrick’s Day special, massive platters of corned beef and cabbage. Downtown Madison sits on a land bridge between two large lakes, and when we roll into town at sunset on a bike path beside Lake Monona, we get a transcendently beautiful view of the capitol building’s rotunda. Although I’ve never lived here, visiting Madison always feels like a bit of a homecoming, since my great-grandfather Saul Sinaiko emigrated here from Russia in 1887 and used to own Badger Liquors, still in business on State Street. In the early 1950s his son promoted the store by crooning pop tunes on a radio showed called “Don Sinaiko Sings,” and a young coed named Corky Hale used to back him up on harp—she went on to record with stars ranging from Billie Holiday to Björk. Our group pulls up to the Great Dane brewpub, a stone’s throw from the capitol, where we’re welcomed by local cyclists, including members of the Greasy Gears, an all-female dance troupe that performs with BMX bikes. The brewery is packed with rowdy college students from the University of Wisconsin, decked out in emerald-colored beads and plastic leprechaun hats for St. Pat’s, and when I order a tall glass of Crop Circle hefeweizen, it arrives dyed bright green. In true Madison hippie fashion, our entire group crashes that night on the floor of a ramshackle student co-op house, but since I’m worn out from the day’s riding and the night’s pub-hopping I actually get a decent night’s rest. That’s a good thing, because the bike ride home the next day is twice as difficult, since we have to fight a stiff headwind. (If you’d like to try this excursion yourself but aren’t up for riding seventy-five miles for two days in a row, you can ride home via the Van Galder bus, which offers frequent service from the UW student union to the Loop and accepts unboxed bikes. Back on the train we tie up our bikes and flop down in our seats, exhausted. But one of my fellow Frozen Snotters, a guy named Jared, lifts our spirits by surprising us with cold bottles of New Glarus Spotted Cow Ale he’d recently stashed in his saddlebag. Since the beer is only sold in Wisconsin, it’s a special treat, and thanks to Metra’s liberal alcohol policy we’re able to enjoy it on board. Popping the caps with my Swiss Army knife, we toast the end of another successful bike-and-train adventure. Bike Snob NYC comes to Chicago The satirical bike blogger promotes his new book with a social ride up the lakefront followed by a reading. Thursday, March 29, ride leaves Tati Cycles, 1013 East 53rd, (773)598-8284, 6pm; reading at On the Route, 2338 West Lawrence, (773)989-2453, 7:30pm, bikesnobnyc.blogspot.com; free. Chicago Critical Mass Join hundreds of cyclists for this monthly bike parade and demonstration for bike-friendly streets, which promises to be the first big mass of the year, to a destination yet-to-be-determined. Friday, March 30, Daley Plaza, 50 West Washington, chicagocriticalmass.org, 5:30pm; free. Major Taylor Trail Clean-up Work gloves and tools will be available for volunteers to help cut brush and trim trees alongside this Southwest Side bike path, named for the African-American cycling champ. Saturday, March 31, 111th and Aberdeen, (312)520-1641, majortaylortrail.org, 2pm-4pm; free. Silent Bike Auction Working Bikes Cooperative clears out its collection of rehabbed rides, including Schwinn Stingrays and Hawthorne ballooners, to help pay shipping costs to send bikes to sister co-ops in developing nations. 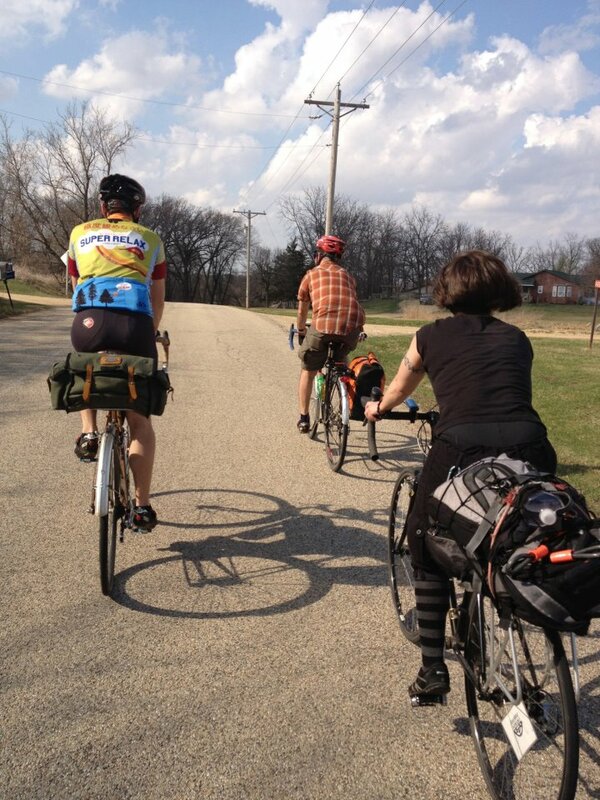 Sunday, April 1, 2434 South Western, (312)421-5048, workingbikes.org, 9am-11am; free. Liar’s Ride In honor of April Fool’s Day, this irreverent bike tour features “stand-up comedy on two wheels,” poking fun at the Chicago bike scene and current events. Sunday, April 1, Ciclo Urbano, 2459 West Division, (773)255-6347, tinyurl.com/liarsride, 6pm; free. Women and Trans Night West Town Bikes hosts this weekly open shop session strictly for female and transgender folks who want to work on bikes in “non-patriarchal” surroundings. 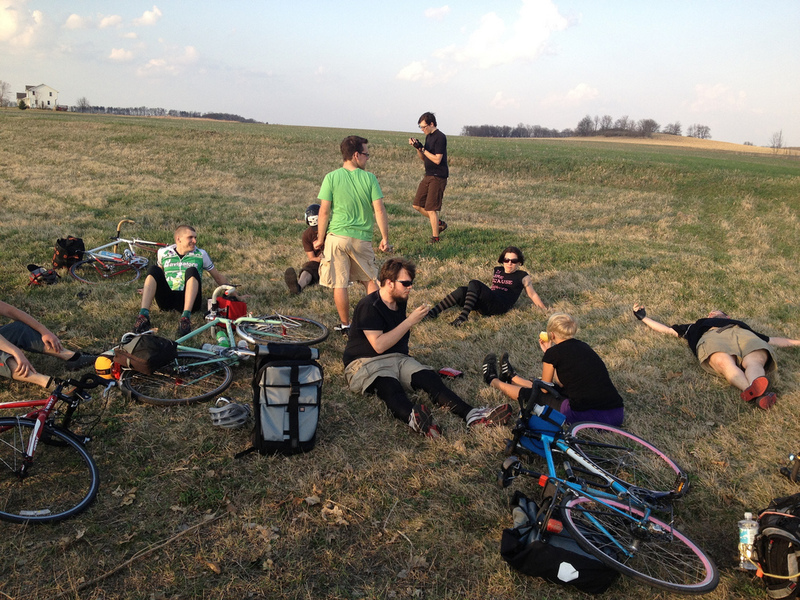 Wednesday, April 4, 1147 North Campbell, (773)772-6523, westtownbikes.org, 7pm-10pm; $10/hr suggested donation.